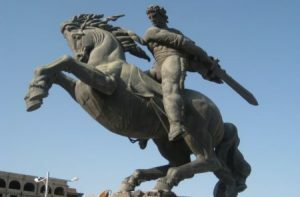 David of Sassoun is the main hero of Armenia’s national epic Daredevils of Sassoun, who drove Arab invaders out of Armenia. The Daredevils of Sassoun (also known as after its main hero David of Sassoun) is an Armenian national epic poem recounting David’s exploits. As an oral history, it dates from the 8th century, and was first put in written form in 1873 by Garegin Srvandztiants.